My initial plans had been to work in the operating room at Bwaila but most obstetrical surgery in Malawi is performed by clinical officers and medical officers and Bwaila is an important training facility for them. The labor and delivery ward which is a nurse-midwife run program however desperately needed the presence of consultants to assist in the management of more complex problems. There are far too many babies born with low Apgar Scores (less than 4 at one minute of life) and I found myself using my anesthesia resuscitation skills several times every day to resuscitate these infants. Fortunately most had good five minute Apgar Scores with just assisted ventilation since there are no facilities available for intubation and ventilation. Another frequent event was eclamptic seizures. 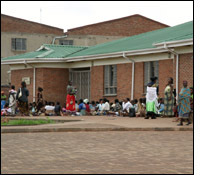 Patients are transferred from the district facilities because of eclampsia that has often presented at the patient's home. Because there are often shortages of medications at the district level hospitals patients often had not received magnesium sulfate before transfer and arrived still having seizures. These are rare occurrences in the rich nations because of our far more frequent prenatal visits and surveillance for proteinuria and hypertension. Not so in the poor nations of Africa where there are few prenatal visits and little surveillance for preeclampsia through urine and blood pressure screening. Another challenge was working with minimal labor monitoring. Bwaila has only two cardiotocography units for external fetal monitoring that must be rotated between all the patients on the ward. The routine monitor is a wooden Pinard fetoscope and the ear of the midwife. The electronic units could only be used prior to the initiation of oxytocin augmentation and for monitoring multiple gestation pregnancies or other high risk situations such as antenatal hemorrhage. Despite these differences in monitoring most labors and deliveries went very smoothly, but when there were less than optimum outcomes I sorely missed my routine external and internal fetal monitors. The best part of my experience was getting to learn to do twin vaginal and breech deliveries which I never do in the United States. The Norwegian doctors mentored me through three sets of twin breech/breech deliveries and when I next return to work in the less developed world I will feel far more capable to handle these higher risk deliveries than before this trip.